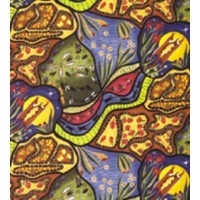 Marie Ellis is a well known Aboriginal Artist from Alice Springs (Amoonguna Community). 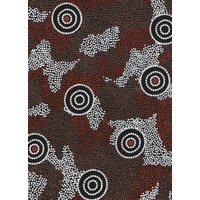 Marie is the daughter of Michael Nelson Jakamarra a well known Papunya artist and Roseanne is her sister. She is an Arrente and Warlpiri woman. In this artwork Marie depicts salt plians or salt pans. Salt Plains are surrounded by extensive areas of sand dunes in a flat, arid landscape. Central Australia is big and dry place with numerous large dry / salt lakes especially in Northern Territory. These creviced lakes are even more spectacular on the ground, typifying the beauty of the harshlands of Australia, specifically during the dawn or dusk.